The world produces enough food to feed everyone on Earth. Yet, almost one billion people live in hunger. Estimates are that between one third and half of all food produced globally is wasted or lost along supply chains every year. This amount alone would be enough to feed twice the number of hungry people in the world. What if we start seeing food losses and waste not only as problems but also as an untapped opportunity? By forcing us to think differently, solutions to the food waste challenge can become enablers of policy changes, social development, environmental governance, and business innovation. Wasting food has environmental, social, and economic costs that start adding up right at the farm, and increase with every additional step towards the consumer. The household is where the highest percentage of food waste takes place. Households in economically developed countries are responsible for about 38% to 47% of their country’s food waste. 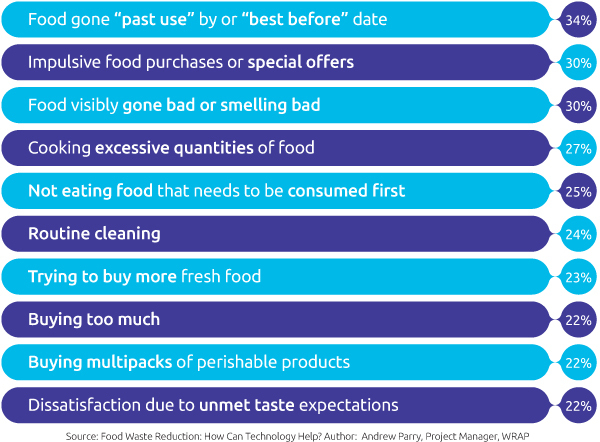 According to research from WRAP, a UK-based Waste & Resources Action Program there are 10 main reasons for food waste at home. In this point-of-view report, co-authored by Capgemini and the Consumer Goods Forum, we explore the root causes of consumer food waste. Beyond the challenges, the report identifies opportunities that this problem reveals for food producers and retailers and suggests ideas for adopting a digital technology approach that will change consumer behaviors and contribute to profitable business growth for food producers and retailers.